The conference brings together more than 150 senior level attendees, 20 hours of cutting-edge presentations delivered by more than 30 expert industry speakers representing more than 15 countries. The conference was a great opportunity to join a number of forums, from thought-provoking speeches related to ‘cost benchmarking’ through to comparisons on how straight-forward decommissioning and demolition techniques have been successfully used in the US. I had 2 roles at the event, one as the NDA’s Lead Programme Controls Manager and the other as an ambassador and representative of Women in Nuclear (WiN). Given my focus on WiN at the event, I found it striking that, out of the 19 speakers and 2 conference chairs, only 3 were female. Out of over 100 attendees, less than 10% were female and there were even fewer attendees aged between 20 and 35. We did manage to recruit a number of new female and male members…and we even had enquiries from someone who was interested in expanding the WiN Global remit into Lithuania! It’s clear that the WiN industry charter is helping raise awareness, but we need even more support and momentum to promote acceptance of women’s capability, knowledge and experience in what has historically been a male dominated environment. We had an excellent opportunity to hear first-hand from companies and individuals about their experiences in the nuclear industry. Everyone I spoke to offered their strong support in striving towards achieving a truly diverse workforce across the nuclear sector. Improving the gender balance in our industry can provide us with the effective, challenging and innovative teams that we need to drive success in such a changing and evolving arena. As Chair of the Attraction Committee for WiN UK, it was particularly useful to speak to many of the new companies that are joining the sector; several that I spoke to already had achieved a healthier gender balance across their teams and, consequently, they offered great insight into how we can ensure that women looking for a first career path or a change in career can clearly see how the nuclear sector, with its huge variety of opportunities, can offer them the prospects and challenges they are looking for. For me personally, the conference provided some great insights into the techniques, processes and innovation that are being applied in support of nuclear decommissioning across Europe. It highlighted the huge range of skills and knowledge we need to support activities in the future. A presentation by Dr Shakardokht Jafari epitomised the need for cross-sector collaboration combined with an innovative approach to problem-solving. Dr Jafari described how she had applied her knowledge of medical radiotherapy along with materials technology and even her knowledge of jewellery making from when she was younger, to develop micro silica bead array detectors that could be used in a variety of specialist applications across the nuclear sector. It was inspiring work that encourages us all to think laterally when looking for solutions. WiN UK is grateful to the event organisers for inviting us to this event. 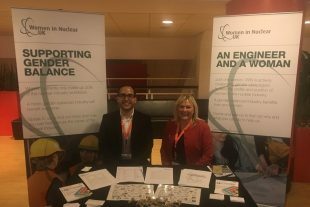 The event provided a platform for nuclear experts from around the world to share their views, discuss challenges in the sector and create new connections with individuals and companies who have not been previously involved in WiN UK initiatives. WiN UK helps individuals grow their experience by getting involved in exciting projects and creating long-term networks with nuclear companies who are keen to drive equality, diversity and inclusion in the sector. What differentiates WiN UK from other similar organisations is that it does not recognise barriers as it expands regionally, nationally and globally. For this reason we look forward to talking with more individuals who are interested in this area and identifying opportunities for mutual development. Anyone interested in improving gender balance in the nuclear industry is welcome to join us as WiN Ambassadors or become part of the growing WiN Industry Charter network (around 60 nuclear companies, including the NDA have already signed up).